47 entries categorized "Geek of Language"
"You don't understand. I coulda had class. I coulda been a contender." That is to say, instead of literally rendering the famous lines from the Hindi films ("How many men were there?" &c.) the subtitler chose a conceptual translation that slipped the category of "famous lines from Hindi films" to "famous lines from Hollywood films." This rendition conveys the force of what is happening on the screen - the dog is reenacting famous movie scenes - much better than could have been done by a literal translation. I have read essays by Douglas Hofstadter about this kind of translation; the concept comes up a lot in different permutations throughout his work, especially in his book Fluid Concepts and Creative Analogies. The subtitling in the Roadside Romeo trailer is perhaps more precisely viewed as an analogy than as a translation. And yet, if the purpose of a translation is to convey the meaning and intent of the original to speakers of a different language, then the Roadside Romeo trailer is perfectly rendered; it is not a linguistic translation only, but also a cultural translation. A couple of weeks ago, David commented that he is sometimes confused when people use the word "bucks" to refer to currency other than our own U.S. dollar. He's got a certain sense of the meaning of "buck," of its value, and he finds himself surprised for a moment when it's used to mean something else. But the fan is pissed off. Like hell. It takes a lot of hard work to earn money and then to pay 500 bucks for a movie ticket shows passion. and what does the fan get in return - crap. 500 bucks for a movie ticket??? It took me a moment longer than it should have to remember what I was reading: that's 500 Rupees . Here's a very nice post by Language Log's Heidi Harley that illustrates what happens when good noun modifiers go bad. In the example she gives, there are three consecutive noun phrases and it's not immediately obvious how to identify heads and modifiers among them. The phrase is "philosophy of mind reading group" - the ambiguity is between (philosophy of mind reading) (group), on the one hand, and (philosophy of mind) (reading group) on the other. Prof. Harley's post is made more interesting by sentence diagrams and sound files illustrating how, in spoken English, stress breaks the ambiguity. She refers to the "compound stress rule" and links to another Language Log post on the subject - the link is broken, so I found a different one to link. English forms compounds so readily that I wonder if there is really an analogue to the compound stress rule in other languages that are less compound-friendly. Is there a change in stress when compounds form in German, one of the few languages that is more compound-happy than English? Hindi is a very even-stress language; unlike English, in which there are complex rules of word stress, all syllables in Hindi should be given the same stress. What might be heard to English-speakers as difference in stress (for example, in the minimal pair कमल kamal, lotus, and कमाल kamaal, wonder) is actually a difference in vowel length. So although Hindi does form compounds, I don't think there would be any stress-shift analogous to English. Prof. Bill Poser, one of Language Log's regular contributors, posted yesterday about the word "nyet" written in Roman characters stylized to look like Cyrillic. It reminded me of my post of about eight months ago where I wrote about Devanagari lettering (I mistakenly called it typeface) styled to look like Urdu, and other stylistic exoticizations. I emailed Prof. Poser, and before I knew it he had posted on Langauge Log a link to me. Language Log has tens of thousands of regular readers - 1400 of them have visited me in the last 12 hours or so. That's quite a traffic spike for this humble little blog, that hums along ordinarily at less than 40 page views a day. Thanks to Prof. Poser for the hat tip. One Language Log reader followed up with his own interesting post on the same subject: Chinese characters stylized to look like Tibetan. Tibetan script is lovely; it's a descendant of Devanagari that I once mistook for Bengali. Here is a sample of Tibetan script and one of Bengali script. A propos my previous post and the other stuff I tend to write about in this blog, the Times of India has a very interesting article about the fellow who translates the Harry Potter series into Hindi, Sudhir Dixit. 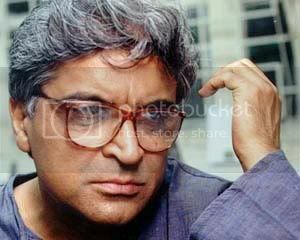 As a student Sudhir Dixit was a fierce nationalist who refused to learn English. Later he relented and went on to become a professor and scholar of literature in both English and Hindi. For instance, in Hindi, unlike in English, expression of respect is unambiguous. So, Dixit had to decide if the character of Snape had to be addressed with respect or with disdain. Dixit would take a long time to decide between 'kar raha tha' [familiar and extremely disrespectful way to refer to an authority figure] and 'kar rahe the' [formal and respectful]. He eventually decided to treat Snape with respect, "because, he is after all a professor". But I wonder if the characters show the same respect for Prof. Snape that Prof. Dixit does - whether Harry would exclaim "Snape aata hai!" or "Snape aate hain!" when he's about to be caught doing some mischief or other. I'll have to get the books and see. For my birthday in May, David gave me a copy of The Cambridge Grammar of the English Language, a massive volume edited by linguists Rodney D. Huddleston and Geoffrey K. Pullum. Geoff Pullum is my linguistics hero - he's exuberant, tart, and totally addictive - and even in this technical magnum opus his voice comes through loud and clear. The introduction includes some strong words against prescriptivism, and distinguishing the grammar from a style guide - two of Pullum's favorite betes noirs. I like the organization of the book. This is not your sixth-grade teacher's grammar book; it exposes the imprecisions in the version of English grammar we are taught in grade school and offers enough generalized terminology to help develop a foundation for understanding comparative grammar. It is not really intended to be read end to end - it's more than 1800 pages long - but its sequence is logical and attempts to introduce technical grammatical concepts no the non-grammarian. It even isolates in sidebars discussions that may be too technical for non-linguist readers, keeping the book accessible both for academics and for linguistics dilettantes like myself. If I were a linguist - and who knows, I may yet be, as I have not decided what my next career will be - I think I would be a grammarian, because as fascinating as historical linguistics is to me, I don't have the head for the history and anthropology portions of it. Grammar, on the other hand, has fascinated me longer than I had realized. In college I took courses on formal semantics (with this guy) and learned how complicated a proposition it is to try and reduce natural language to an abstract set of rules. Those studies gave me the foundation to understand why it took Profs. Pullum and Huddleston 1800 pages to set forth the grammar of English - and they don't even reach some specialized grammars, such as the peculiarities of newspaper headlines. Since then, as my grammar-wallah posts demonstrate, I am delighted by consideration of the diverse structures employed to express similar ideas across different languages - subtle shades of verb meaning, relationships between semantic elements, interrogatives, and more. The distinctions and relations between the grammatic structures of human languages is endlessly engaging. That's why I'm going to try to read the Cambridge Grammar cover-to-cover, even though it may take years. The expressive power of human language is barely adequate to convey the profound level of apathy word puzzles provoke in me. I despise them. Read the rest of the post for more. In the language discussion section of the BollyWHAT? forums, I recently came across an excellent point about language learning. Meredith, the founder and owner of the forum, said to a member asking for a translation of a particular English sentence: "BF, you say you understand a good deal of Hindi; hence I suspect you know more than you think when it comes to how things should sound in the language. Why don't you try thinking about how you'd express your idea in Hindi before you even make it explicit in English? I think this is generally the way we learn to be more fluent speakers: by letting go of the English and working within the Hindi to express ourselves." Another member, omlick, who founded and runs a Yahoo! discussion group (of which I am a member) for intermediate and advanced students of Hindi, added the following: "Yes, that is exactly right. The trick is to think like a Hindi speaker, not an English speaker. That can take you a long way. I think that in English too, when we express things, we tend to overdo it with the complex language and the metaphors. Drop those first and simplify. Even if the Hindi sentence that you come up with doesn't seem so sophisticated, at least you get your thoughts across in the new language and that is a big step." Meredith and omlick have hit on something that resonated with me more than I can say, and I've been thinking about it a great deal since. A key step on the road to fluency is to let go of familiar English idioms and start thinking about how thoughts are expressed in the acquired language (Hindi, in my case). I've been starting to do this in my own Hindi composition and conversation, though not consciously. Thoughts that are expressed in English with the verb "to like" are commonly rendered in Hindi with a verb phrase that in word-for-word rendering means "to strike one as good". "I liked the movie" in Hindi would be film mujhe achchi lagi, "the movie struck me as good." This kind of "indirect" construction, where the subject of an English sentence is rendered as an object in Hindi, is extremely common. Where in English you would say "I know a little Hindi," in Hindi you'd say thoDi-si hindi mujhe aati hai, "a little Hindi comes to me." Where in English you'd say "I have a fever," in Hindi it's mujhe bukhaar hai, there is a fever to me. In English, "I'm hungry," but in Hindi, mujhe bhuukh lagi hai, "Hunger has struck me." And on and on and on. This is just a small example of the mapping of English idiom onto Hindi idiom. Learning to think in Hindi - to think in these idioms, to have a natural feel for what type of Hindi construction best represents an English idiom - will take me within reach of proficiency. I can feel it starting to happen, and that's very exciting. And now I am off to go chat with a native speaker, so I can put that thinking into action. I recently attempted to read a transcript of an online chat with Javed Akhtar. Javed sahib is a giant of the Hindi film industry; as a scriptwriter and lyricist on some of Bollywood's most influential films over nearly four decades, he has had a hand in shaping modern Indian culture. I've talked about Javed sahib at some length here before. He is a brilliant, thoughtful, erudite, literate, gifted, opinionated man. I've heard him speak passionately about language - about his own language, Urdu, and also about the effect of the importation (and imposition) of English at all levels of Indian discourse. So it was a bit of a cognitive disconnect to find his chat transcript loaded with IM-speak - "u" for "you," "ppl" for "people," "gr8" for "great," and so on. If anything proves that orthography is not necessarily correlated with literacy, it's Javed sahib's use of IM-speak. I am not experienced in IM-speak; it is faster for me to type longhand using standard spelling, punctuation, and capitalization than it is to work out the appropriate abbreviations for what I want to say. So Javed sahib's facility with the shortcuts suggests that he uses them very frequently, so that they are under his fingers to the extent that it is efficient for him to use them. I understand that communication via SMS - text messaging - is even more widespread in India than in my own United States, where it is still largely a medium of teenage communication. In India, where the cellular and internet infrastructure is in far better shape than the conventional telephone infrastructure, SMS is prevalent among a much broader slice of society. It is conceivable that even the exalted literati really do use it every day; hence Javed sahib's fluency in IM-speak. I lack that fluency, and therefore found the transcript exceedingly hard to read. Judge for yourself: Over at BollyWHAT? you can find a post containing the original transcript, and another post with my heavily edited version of it, in which I have rearranged the text so that answers immediately follow the corresponding questions - and translated the IM-speak into standard orthography.